Diva Devotee: Duelling Divas: Who sang "You've got the Love" better, Florence Welch or Joss Stone? 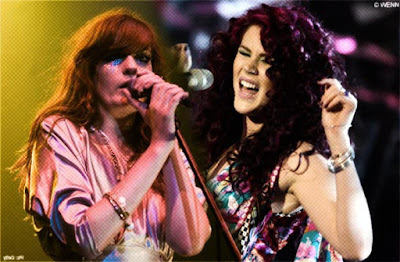 Duelling Divas: Who sang "You've got the Love" better, Florence Welch or Joss Stone? You've got the love is a song with so many twist and turns in its development, not to mention all its subsequent remixes, that I'm not even going to attempt to cover its inception and evolution in this post, because quite frankly I can't even make sense of it. Instead I present to you the 1986 Funk/disco/ gospel version and its darker, arguably more famous- not to mention my first encounter with the song- 90's house remix entitled the "Now Voyager Radio Mix". Well now you've sampled the source material, here are the two, distinctly different versions of the classic anthem sung by two stylistically, very different British Divas; Joss Stone and Florence Welch. But who sung it better? I'll leave that decision with your expert ears! Joss Stone: Joss Stone approaches the song with her trademark funk/soul flair, that gives the song a lighter, warmer- and I feel- truer reflection of the songs God praising lyrics. The song is altogether more organic, and earthy than either the original or the Florence version, with Joss' voice shining with an emotion and conviction that is palpable. However, the song lacks the weight or the drama of the original or the Florence version. Florence Welch: Florence does what she does best and approaches the song from a theatrical perspective, both musically and vocally. Her voice starts off soft and emotive, much like the backing track, and it steadily builds to an almighty, satisfying crescendo. By the end Florence is wailing like a banshee, with her chest voice and quivering vibrato sounding impassioned and frenetic (if not a tad over the top). Florence has it for me - I love how it builds so well to a really dramatic finish. Amazing how much more theatrical pop vocals are becoming. I have a suggestion for your next 'duel'...can we have Beyonce 'At Last' versus Christina Aguilera 'At Last'? They both love singing it live, but I feel christina tends to obliterate the melody somewhat with too many riffs. That is a very good suggestion, I'll note that down! thanks for commenting! No probs. If you go on youtube, Beyonce sings it well at the Obama inauguration - then you can compare that to Aguilera singing it in 2003 caked with bad makeup bless her. I warn you though, Christina's version contains approximately 8000 notes. Technically very impressive but rather lacks the emotion of Beyonce.